Entdecken Sie die alte Geschichte von Troja auf einer ganztägigen Sightseeing-Tour von Istanbul aus. Reisen Sie mit komfortablen Reisebussen durch die europäische Seite der Türkei nach Gallipoli. Überqueren Sie die Dardanellenstraße mit der Fähre, um Troja, ein UNESCO-Weltkulturerbe, zu erreichen. 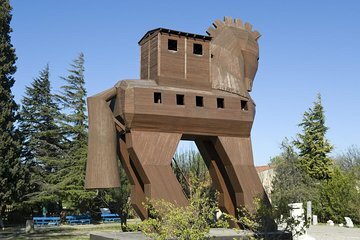 Ihr Guide zeigt Ihnen Highlights wie eine Nachbildung des Trojanischen Pferdes, antike Ruinen aus neun verschiedenen Epochen, den römischen Tempel (Bouleuterion) und vieles mehr. Inklusive Mittagessen, Eintrittsgebühren sowie Abholung und Rückgabe des Hotels. The trip was well organised and i was prepared for the 5 hour road trip to get there, however i found that after we linked up our guild he was telling the driver to slow down so he could tell the story of troy which at first i thought would be ok however he would tell half a story then go off on a tangent about something else and get confused so imparted no knowledge. This all ate into the time we could spend at the site which was already limited due to the long drive. I feel we wasted time on the way there and by visiting some shed on the way which all of the group were confused by, i would have much preferred more free time at the site as by the end we were only allowed 10 minuets which was just enough time to use the rest rooms and take one photo. It is a very long way to travel. The guides are good and the drivers are careful. The let down was the very basic lunch provided and the meals at the comfort stops on the way to and from. This tour to Troy was an amazing experience, we travelled in April 2017. It was well organised, comfortable transport and fabulous lunch! The Tour Guide was very informative and helpful. It was a small group and we were giving reasonable time for all the activities, shopping and photos sessions. Always take a light jacket during the cruise is a bit windy and cold. The transport was very comfortable and they accommodate all our needs on the way to the historical site. This part of Turkey is a must do.... the views are amazing and everything is cheaper than in Istanbul. Food was absolutely lovely! Turkey is an amazing country, lovely food, friendly people and they are very helpful. A must when in Turkey. Emre our guide was very knowledgable and the whole day was filled with wonder of Turkish rural areas and of course the rich and wonderful history around Troy.